The Holodomor Torch of Remembrance arrived outside Manchester Town Hall in Albert Square at 7.00pm. in the hands of the representative of AUGB Stockport Branch, Mr. Mike Kuziw who handed the Torch over to the Chairman of AUGB Manchester, Mr.Mike Mandzij. Over 200 people had gathered for this commemorative event. 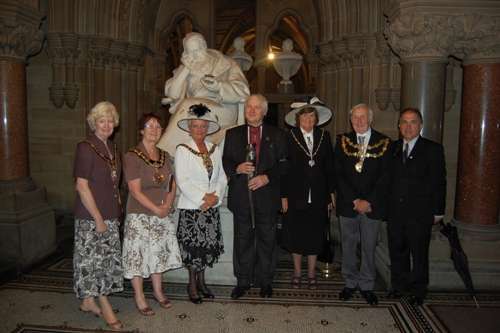 Among the distinguished and honoured guests were HE Ambassador of Ukraine, Dr. Ihor Kharchenko, the President of the Ukrainian World Congress, Mr. Askold Losinskyj, a survivor of the Holodomor, Mrs. Anastasia Ostapiuk, The Lord Mayor of Manchester,Cllr Mavis Smitheman, Mayor of Salford,Cllr Margaret Morris and Mayoress Mrs. Anne Walters, Mayor of Bury Cllr Peter Ashworth and the Mayoress, representatives from Manchester City Council, Mr. Tom Dempster- Principal Development Officer (International), and Christine Thomas, Jenny Andrews-Head of Education Services, Superintendant Chris Thompson from GMP police. 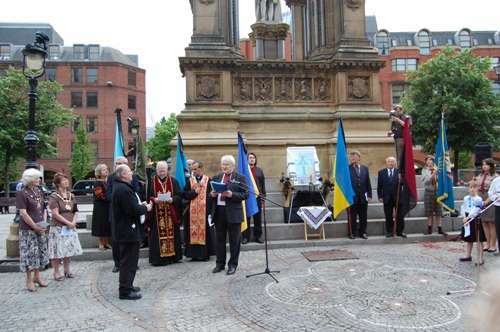 Representatives of Ukrainian Community Organisations in Manchester- AUGB, Ukrainian Women’s Organisation, Ex-servicemen’s Organisation, Ukrainian Youth Association, Ukrainian Scouts all came with their flags to honour the memory of the 7-10 million Ukrainians who perished in the Holodomor. With the Torch Mike Mandzij lit the candle next to the Holodomor Memorial portrait and officially opened the event and invited our VIP guests to say a few words. The Ukrainian Ambassador HE Dr. Ihor Kharchenko and the President of the Ukrainian World Congress Mr. Askold Losynskyj spoke about the horrors of the Famine-Genocide of 1932-33 deliberately organised by Stalin in order to destroy the Ukrainian people physically and to break their spirit and opposition to the communist forced collectivisation programme. A survivor of the Holodomor Mrs. Anastasia Ostapiuk spoke movingly about her own personal experience of the Holodomor, of the family and friends, villagers and children , who all died a terrible death by starvation. Fr. Matwijczuk from the Ukrainian Autocephalous Orthodox Church and Fr. Babij from the Ukrainian Catholic Church led the prayers and requiem in Ukrainian and English so that every person present could participate fully. Despite the pouring rain everyone remained in place to hear the teenage members of the Ukrainian Youth Association in Manchester read extracts about the Holodomor and children from the Ukrainian Saturday School in Manchester read a poem - “Through the eyes of a child”. The Torch was re-lit and Mr.Mike Mandzij handed the Torch to the Lord Mayor of Manchester, who expressed her support in the name of all mancunians for the commemorative event and passed the Torch to Mr.Askold Losynskyj to take to Edinburgh.